Praveen Pardeshi, a 1985-batch IAS officer who is known as ‘super’ bureaucrat, is Maharashtra CM Devendra Fadnavis’ right-hand man. New Delhi: In 2016, when then Congress leader and Rajya Sabha MP Narayan Rane, who is now with the National Democratic Alliance (NDA), launched a scathing attack on Maharashtra Chief Minister Devendra Fadnavis in the state legislature, he insisted that Fadnavis was only one of three chief ministers in the state. While Rane did not name the third CM, he identified senior IAS officer Praveen Pardeshi as being Maharashtra’s second chief minister, saying the bureaucrat calls most of the shots in the state government. The bellicose Rane statement had political motivations but it did give a glimpse of how political leaders perceive Pardeshi and the power that he yields as Fadnavis’ right-hand man in the state bureaucracy. Pardeshi, a 1985-batch officer and the additional chief secretary to the CM, has been a key member of Fadnavis’ core team ever since the second-youngest Maharashtra CM took over the reins of the state in November 2014. Fadnavis brought in Pardeshi to head the chief minister’s office as principal secretary in his very first bureaucratic reshuffle, within days of taking oath as chief minister. Since then, Pardeshi, 57, who has the reputation of being a soft-spoken but firm and efficient bureaucrat, has been firmly by Fadnavis’ side, whether it is for internal meetings, official visits and even most foreign tours. An economics post-graduate, Pardeshi has previously worked with departments and government bodies related to forests, environment, finance, urban development, revenue. 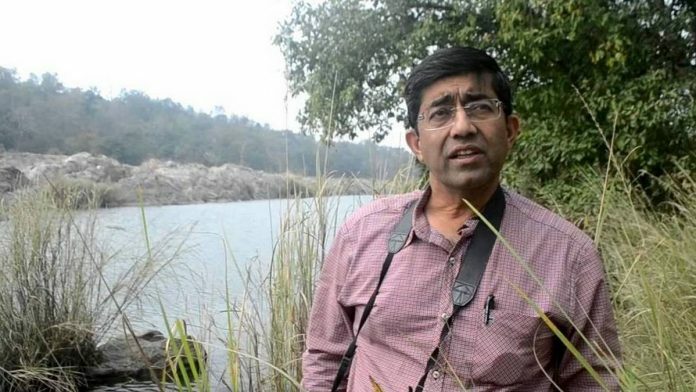 The IAS officer’s most celebrated stint was his term as the district collector of Latur when he was credited for efficiently rehabilitating victims of the 1993 earthquake. While the chief secretary is technically the state’s administrative head, Pardeshi is seen as an officer who wields more influence in administrative corridors. There have been three chief secretaries during Fadnavis’ term — Swadheen Kshatriya, Sumit Mullick and the incumbent D.K. Jain — but Pardeshi has firmly remained the foremost bureaucrat at the chief minister’s side. One such trip in July 2015 landed Fadnavis in a controversy. The chief minister was travelling to the United States with a bunch of bureaucrats, including Pardeshi, who reportedly forgot to carry his new passport that had the visa stamped on it. Fadnavis allegedly delayed the Air India flight and refused to travel without his entourage. He battled severe flak from not only the opposition but also his government’s coalition partner, the Shiv Sena. The chief minister defiantly denied all the allegations in a series of tweets from the United States and threatened to file a criminal defamation suit against anyone accusing him of holding up a flight. Fadnavis has also entrusted the supervision of one of his dearest initiatives — the war room — to Pardeshi and Kaustubh Dhavse, an officer on special duty in the chief minister’s office. The war room, set up on the seventh floor of the state headquarters, Mantralaya, is a platform to fast-track showpiece infrastructure projects of the Fadnavis government by bringing multiple government agencies involved in them for approvals on the same table. While Fadnavis chairs the war room, it is Pardeshi and Dhavse who minutely monitor the projects, have follow-up meetings with officials and ensure decisions taken in the war room are implemented. Even during the recent deluge in Kerala, the chief minister announced an aid of Rs 20 crore for the victims from the Maharashtra government and put Pardeshi in charge of the mission, while galvanising the entire state machinery to deliver the aid under him. The bureaucrat, who has experience in relief and rehabilitation, was entrusted with the complex task of coordinating the efforts of various non-government organisations, industry bodies, state government officials and being in touch with officials from Kerala and the defence ministry. From aides of ministers, legislators cutting across party lines to industry body representatives, the waiting room outside Pardeshi’s cabin is always flooded with visitors with specific requests of pending work, hoping for the CM’s intervention. “He is a very good officer. I go to him with very local issues from Mumbai concerning my constituency, but he treats them just as seriously as he would treat any mega-project,” said a BJP MLA who did not want to be named. The bureaucrat, however, is not as popular with some members of opposition parties. During a session of the state legislature in 2016, opposition legislators trained their guns on Pardeshi, alleging that his relatives purchased land along the route of CM Fadnavis’ pet Mumbai-Nagpur expressway at a cheap price from farmers in anticipation of handsome returns during land acquisition for the expressway. A Congress legislator, who did not wish to be named, said: “We don’t call Pardeshi a bureaucrat. We see him as the deputy chief minister of Maharashtra. He works quietly, getting whatever work the CM wants done. “But many members from opposition parties are unhappy with him and the influence that he wields. If the government changes hands tomorrow, the new government will probably target Pardeshi first, and Fadnavis later,” he added. This is waste of time this news. If someone is effective and efficient at his duties then its great for everyone. What is the news here??? We all must be proud of such a brilliant and efficient officer like Mr. Pardeshi who is instrumental in fast implementation of projects and redress of the public grievances very efficiently. We need such efficient bureaucrats who are assets for society. I wish him all the best to continue to excel in all the fields. All bureaucrats should be efficient like him to pay back to the society as society is paying to them as salary, perks, respect and priveleges. Guess he is senior enough to be so influential. Take a look at Odisha. There’s a super CM who is from the 2000 batch. He is the political boss and the super secretary in the Government. Even the CS greets him with ….., sir! He is the brilliant officer who is doing so good for the state and he is a great inspiration for others every one should do a great work like him in bureaucracy period. Why should one be jealous of his efficiency to have the command over the assignments given to him? Those who are jealous of him should prove themselves. A big waste of energy for news portal as well as to readers.